Although many top smartphones nowadays can take great pictures, they’re still limited by the optics. This is especially true when you want to obtain a narrow depth of field with an attractive bokeh. Fortunately, there are external lenses out there that you can attach to your smartphone, and improve your mobile photographs. These lenses are oftentimes sold as a set, usually including a wide-angle and macro lens. Fisheye, telephoto and polarizer lenses are also available. So, here are our recommendations for attachment lenses for Android cell phones in 2018. The Moment wide-angle model might actually have a slight quality advantage over the wide-angle lens in the Xenvo Camera Lens Kit Pro. However, considering the big price difference, we recommend purchasing the Xenvo lenses. 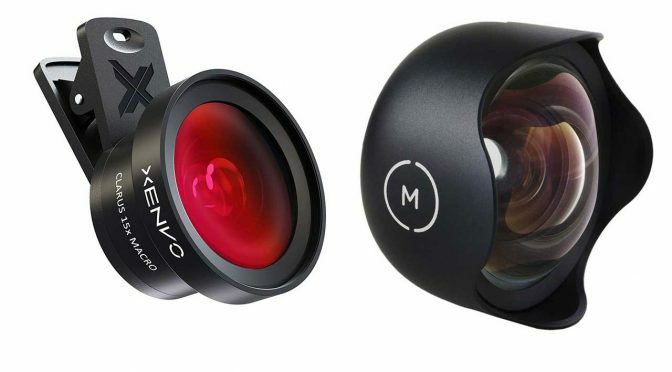 Moment makes some of the most expensive mobile lenses on the market. However the brand enjoys a very good reputation. At the beginning of 2018, the company generated a lot of excitement with its Kickstarter campaign for an anamorphic mobile lens. The campaign raised over $1.5 million (and counting), surpassing its original funding target of $50 thousand in less than an hour! To use Moment lenses, you need to mount them on a Moment case. They cost about $30 and are available for Google Pixel and Samsung Galaxy phones (and iPhone, of course). As you might have noticed, we do not recommend any telephoto lens. Unfortunately, no telephoto lens exists today that creates a bokeh and a narrow depth of field that you typically see in portraits photographed with DSLR and DSLM cameras. The only benefit you get with the current mobile telephotos is a closer shot (i.e. they act as teleconverters). However, you can often achieve the same look by getting closer to your subject and/or digitally zooming in. Previous PostBeatsX vs budget bluetooth headphonesNext PostIntel Optane Memory – Deceptive Marketing?